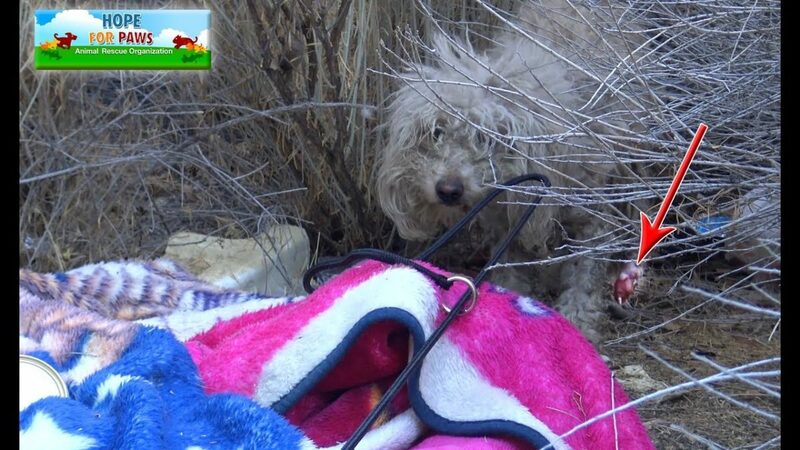 Hope For Paws received a call about a stray dog who was badly injured. Rescuers arrived at the scene early the next morning and the person who alerted them showed them where he was living. 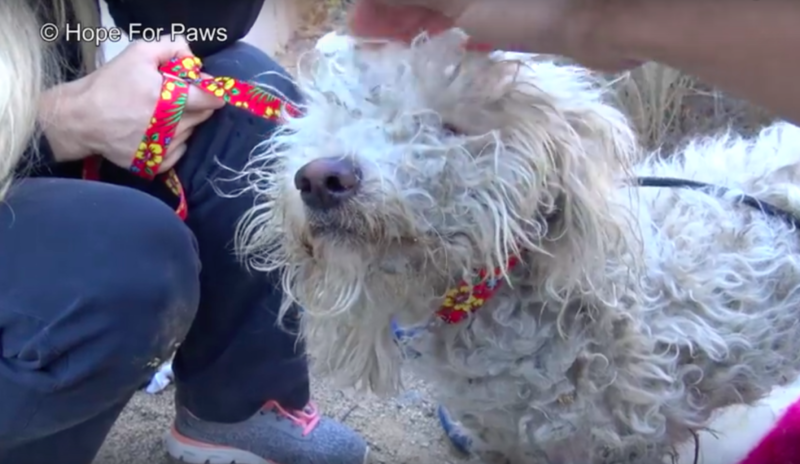 The dirty, matted dog was lying in the dirt amongst trash. The only comfort he had was a blanket that someone must’ve left for him. 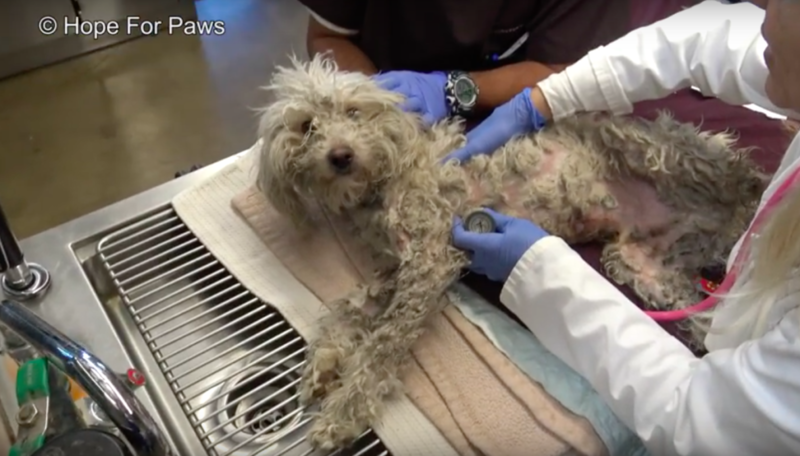 As the rescuers got closer to him, they realized he was missing one of his paws! One of the rescuers, Loreta, slowly approached the dog and offered him some food to gain his trust. But the dog was understandably afraid and backed up into the bushes to hide. Eventually, she brought out the gentle snare, but it scared the dog away even more, so they had to think of a better option. Unfortunately, things got even harder when landscapers came to the area 30 minutes later with their loud equipment, making the dog even more frightened. 45 minutes later, Loreta was still sitting there, trying to coax the dog. She was handing him some food, which he was finally taking. But they were running out of food and were worried that he would leave. 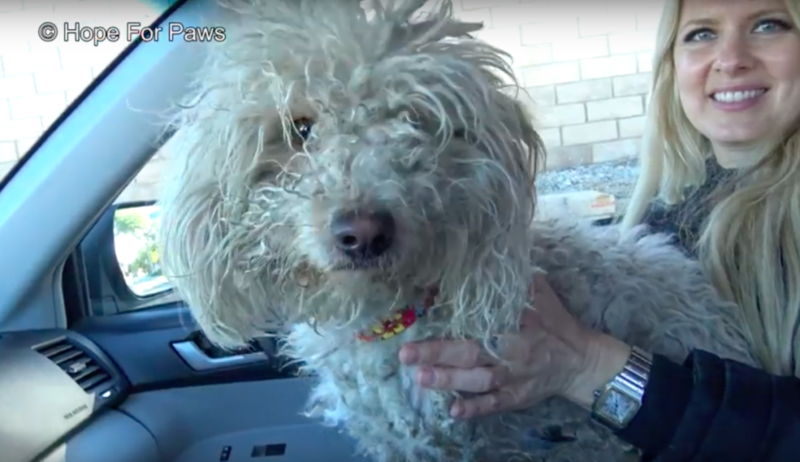 They couldn’t risk the dog running away into the desert, so Loreta had to grab ahold of him. He cried out and even bit her multiple times, but he held on and didn’t give up. They were able to then get the gentle snare around him. They decided to name him Washington, and distracted him with some cheeseburger while they put the leash around him. Eventually, he calmed down and allowed rescuers to pet him. He was finally starting to realize that they were there to help him. They drove back to Los Angeles to get Washington medical treatment right away. 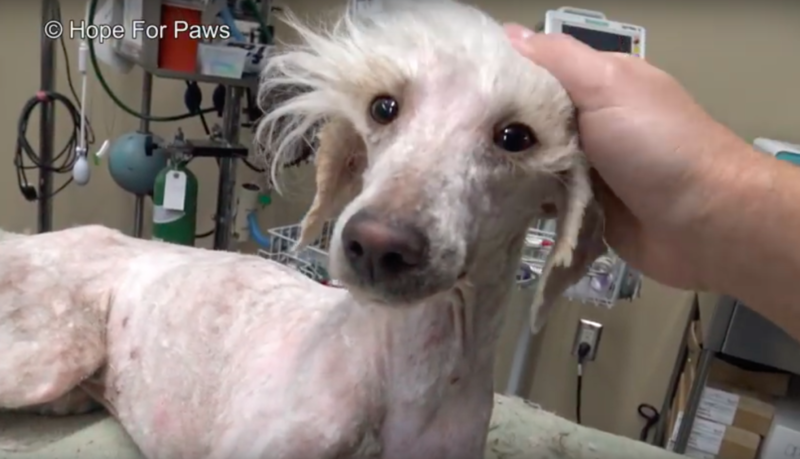 Meanwhile, Loreta went to urgent care for antibiotics and pain killers for her bites. Washington’s leg was so raw, but despite the pain, he still wagged his tail and was just so happy and relieved to be safe. They shaved his matted coat off and gave him a much-needed bath. He looked like a completely different dog! They took x-rays on his leg and found that his paw was mostly gone and the bones were broken and exposed. But thankfully, Dr. Antonio Pedraza found a way to save his leg! Washington underwent surgery and it was a success. Washington is able to run around and play just like any other dog. He is now living with a foster and has made so many new doggy friends. He is also waiting for his forever home. 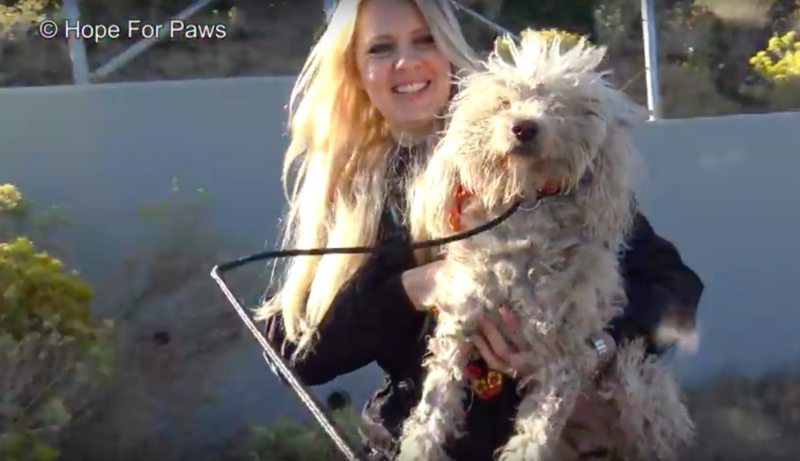 If you’re interested in adopting Washington, contact www.PawPrintsInTheSand.org.